"This is a family recipe handed down from my Grandfather. We have it every Thanksgiving and Christmas. I am not allowed to come without it." Toss avocado cubes with lemon juice in a serving bowl; mix avocado with chopped egg and onion. Whisk together the mayonnaise and milk; add to avocado mixture and gently mix. Arrange the remaining eggs sliced atop the salad in rows. Sprinkle top with paprika. See how to make a fresh pasta salad with avocadoes, tomato, and mozzarella. This is a great recipe...Can also add baby shrimp, and serve on a crisp lettuce leaf. Was pretty good - only needed salt and pepper. 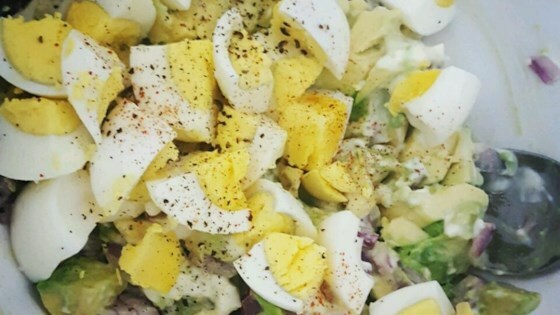 I love egg salad and avocados. Leftovers are not good so make just what you can eat right away. Very tasty! I went a little lighter on the mayo, and added some crumbled bacon and cayenne pepper for a little kick. I will definitely make this again. it was ok. would have just preferred the egg salad. Great way to enjoy avacado. I added a little salt to bring at the flavor a little better.